Formation of crystals from electrolyte solutions is a fundamental process in nature as well as in industries such as building materials and in pharmaceutical industries. Nature is able to mould the crystallisation process using additives to obtain incredibly resilient material such as bones and shells, and the way they are able to control the formation, and structure of the material involve the control over thermodynamics and mass transport. Understanding these processes allows us to create new materials with particular properties of strength, solubility, morphology as nature already does. The focus of our research is to unveil the influence of all these variables and find new ways to control the growth and dissolution of crystals from a fundamental understanding to more exotic strategies. 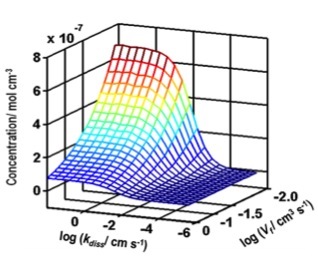 The group is interested in the investigation of the kinetics of growth and dissolution of a variety of crystal structures exploiting a number of techniques. Gypsum presents a characteristic crystal structure in which the layers of the constituent ions alternates with waters layers which give a distintive directional dissolution rates. Using ex-situ and in-situ techniques we are interested in understanding the influence of this characteristic feature via the imaging of ions fluxes at different crystal planes. Dissolution of gypsum via high convective flow cell (H-CFC) and mode of action of several inhibitors showed to give in dept kinetic information on the dissolution of this widely use material. H-CFC are a key tool to access high dissolutions rate, otherwise non accesible by other techniques. coupling this technique with finite element model we are able to extract intrinsic dissolution rate constant and understand the effect of inhibitors on the dissolution rates. This allows to measure rate constant even under mixed transport conditions. M. M. Mbogoro, M. E. Snowden, M. A. Edwards, M. Peruffo, P. R. Unwin, J. Phys. Chem. C 115, 10147-54 (2011). R. Fisher, M. Mbogoro, M. E. Snowden, M. Joseph, et al., ACS Appl. Mater. Interfaces, 3528-37 (2011).